John Calvin (Old French Jean Cauvin)(July 10, 1509 – May 27, 1564 AD) was a French Protestant theologian and lawyer who was a leading figure during the Protestant Reformation. He helped develop the system of Christian theology as found in Reformed and Presbyterian Churches. Many aspects of his thought are referred to as Calvinism. Calvin's father was a notary for the Catholic Church in Noyon, and his father arranged for his education at Universities in both Orleans and Paris. His father at first expressed interest in Calvin becoming a Catholic priest, and at the age of twelve he was tonsured. When a person was tonsured his hair was cut, leaving the top of his head bald. With his father deciding against theology, Calvin began attending the University of Paris to pursue a career in law. Here, he was exposed to Protestant thinking for the first time. At this time, Protestantism did not exist in France as it does today, with reform being popular amongst many of the elite in Paris. This continued until the Affair of the Placards, where pictures denouncing the mass were placed everywhere, including on the King's own door. For this reason in 1534 Francis I began persecuting the Protestant minded individuals, and Calvin fled Paris. During a short stay in Basel, Switzerland, he published the first edition of his masterpiece Institutes of the Christian Religion, which outlined the Protestant faith and explained why Protestant doctrine was not heretical. He would revise and expand this work several times. He had no wish to remain in Geneva. He wanted, instead, to continue his journey to Strasbourg. However, when Farel lost his temper with Calvin's stubbornness and shouted,"If you refuse to dedicate yourself here with us to this work of God, God will curse you, for you seek yourself rather than Christ! ", Calvin felt that God had called him to Geneva. Reformation Wall in Geneva. From left to right are William Farel, Calvin, Theodore Beza, and John Knox. At that time, Geneva was torn between camps, with native Genevans and the recent influx of refugees from France. The newer refugees favored s stricter mode of life, with practices that Calvin denounced. Some people did not take kindly to Calvin clamping down on their "liberty" (which was merely the license to do whatever they wanted-immoral or otherwise). Calvin was threatened many times, banished once for three years, and insulted by having stray dogs named "Calvin" after him. However, his hard work for reform in Geneva paid off. In later years, the liberal attitude of Geneva allowed the city to become known as the "Protestant Rome". It became a safe haven for persecuted Reformed scholars from Scotland and England during the Catholic rule of Mary I and Mary Stuart. Calvin is often remembered for his role as the Prosecutor in the trial and burning of Michael Servetus, who was condemned by many Reformers and by the Roman Catholic church for committing heresy by denying the Trinity. Calvin petitioned the City Council in Geneva that Servetus should have neither a lawyer, nor a translator. Calvin was also responsible in several witch burnings while in Geneva. Servetus was burned at the stake, despite Calvin's recommendation that Servetus ought rather to be beheaded, a form of execution considered in that day to be more honorable. 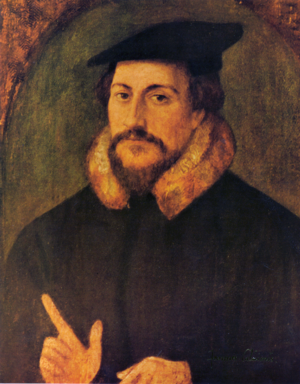 Calvin's work influenced many different Reformational groups, particularly the Presbyterians in Scotland, the Congregationalists and Baptists England and the Dutch Reformed Church in Netherlands. The Westminster Confession, the London Baptist Confession and the Belgic Confession are three statements of belief created by these groups and affirm a Calvinistic interpretation of theology. Calvin's teachings on predestination were later interpreted in a way that has come to be called Hyper-Calvinism by some. So-called Hyper-Calvinists hold that because God imparts his grace to only some individuals of his choosing (the "Elect") there is no point in the visible Church preaching the Gospel to the unregenerate. This point of view has been rejected by almost all Reformed churches and groups. They espouse the preaching of the Gospel to the unregenerate as one of the commands given by Christ himself to his Church, that the unregenerate may be "without excuse" (Romans 1:20-22) on the day of judgment. In the United States, the one Reformed denomination that is associated with "Hyper-Calvinism" is the 7,000 member "Protestant Reformed Churches in America (PRC)." This denomination, however, rejects as inaccurate the use of the term when applied by others to the PRC, arguing that the principles in question are those which were held by Calvin himself and, consequently, cannot be "hyper" or unorthodox. Calvin was the founder of the greatest of republics. The Pilgrims who left their country in the reign of James I., and landing on the barren soil of New England, founded populous and mighty colonies, were his sons, his direct and legitimate sons; and that American nation which we have seen growing so rapidly boasts as its father the humble Reformer on the shore of Lake Leman. This page was last modified on 21 December 2018, at 19:39. This page has been accessed 18,905 times.